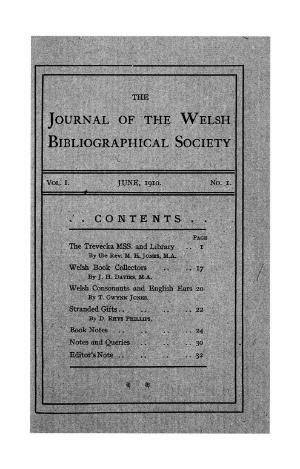 The Journal of the Welsh Bibliographical Society contains scholarly articles on Welsh writers and bibliographic research, and society notes, in English and Welsh. It was published annually from 1910 to 1984. Publisher Details: The Welsh Bibliographical Society (Y Gymdeithas Lyfryddol Gymreig) was founded in 1907 to promote the study of Welsh bibliography, publishing, printing and writing. Its principal activities were an annual meeting and lecture and publication of the Journal and monographs.